Phyllis Schalfly is an icon of America's Conservative Political Movement. 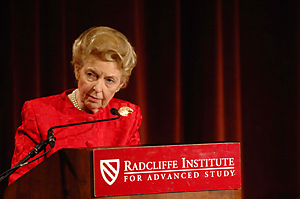 As founder of the Eagle Forum, Mrs. Schlafly has been at the forefront of American politics for over 40 years. She also happens to be an ardent supporter of Shared Parenting. She fully supports children having a full relationship with both parents after divorce and has written expansively on the subject. For nearly a decade Mrs. Schlafly has been writing on the atrocities carried out by the family courts against decent, loving parents. Her collection of works on the family courts, fatherhood and many other topics related to shared parenting can be viewed here. The Awesome Power of the Family Courts provides a sampling of Ms. Schlafly's thoughts on this issue.